He was the father we wanted. When Adam West died a little more than a week ago, I was as anguished as I’ve ever been. 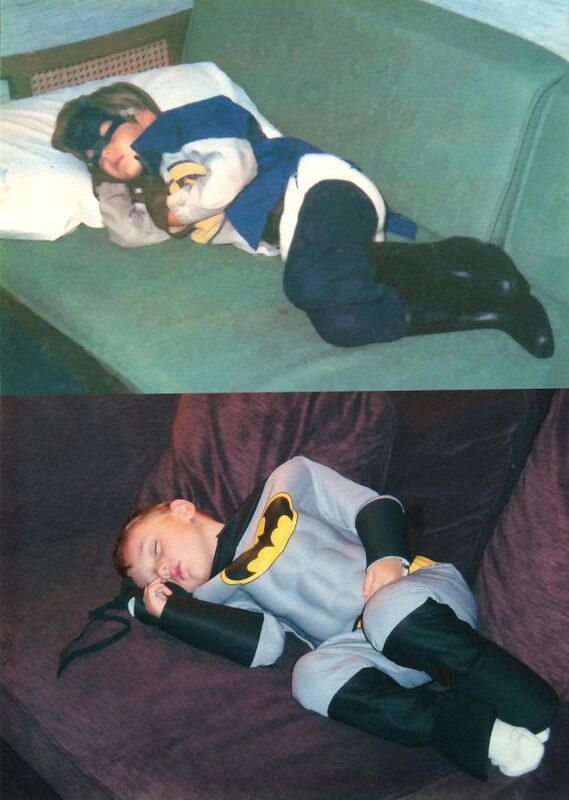 His Batman was the father I always wanted. I’d told people that before, but I was taken off guard by the depth of my feelings and was astonished that I couldn’t croak out two sentences without breaking down. And so I sit here, on Father’s Day, thinking about what that means. See, I’m not alone in this. I’ve spoken and emailed and messaged with many, many people about Adam West over the past week and this has been a common theme. Artist Sandy Jarrell said here that Robin had the best Dad ever. Mike Allred, the Batman ’66 cover artist, wrote about West being a father figure, underscoring comments he’d made to me in the past. Facebook and Twitter were crammed with the same sentiment, whether you had a good relationship with the old man or not. John S. Drew of The Batcave Podcast had a few of us on his show and the topic came up as it inevitably would: Adam West’s Batman as the perfect Dad. Well, I needed that perfect Dad. My folks split when I was young and it wasn’t smooth. Pretty typical, I know, but painful and traumatic nonetheless. 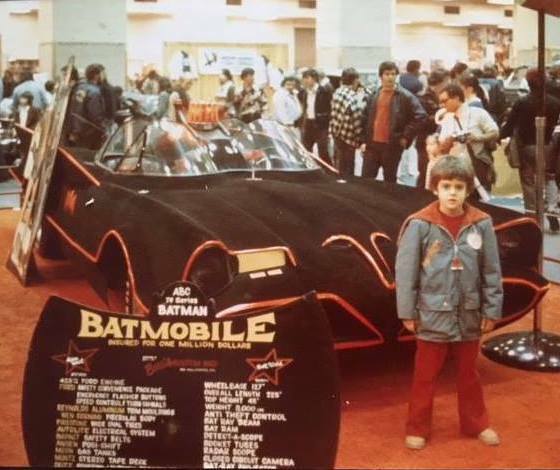 For me, the show Batman was my haven. That go-go world was created by William Dozier and Lorenzo Semple Jr. and a platoon of writers, directors and other producers, yes, but it was embodied by Adam West. Steady, never-say-die, never-lose-your-cool Adam West. We don’t live in a black-and-white world, but for all its DayGlo finery, Batman was as close as you might come: The good were good, the bad were bad and only Catwoman was really in between. Gotham City was the place where I would go to feel safe and secure. Batman had all the answers and he never wavered. He was prepared for anything. And even at the young age of 5, I knew he was going to find a way out of that giant hourglass, or giant teacup, or rescue Robin from that giant clam. This was always a special occasion. As I got older, I rejected the show. By the time I was a teenager, it was considered kids’ stuff, even among — perhaps especially among — comics fans. Reading Batman comics was passe among some in my set: “You gotta read Daredevil by this guy Frank Miller,” they’d tell me. By the time Miller’s The Dark Knight Returns and Batman: Year One came around, I didn’t want anything to do with this show that had such a profound impact on me, even if I didn’t recognize it at the time. I was as horrified as the rest of the Batman fandom when Michael Keaton, a comic actor, was cast in Tim Burton’s movie. I can only imagine what it would have been like had there been an internet. Me at 6, above. My son Sam at 3, below. No, he wasn’t posed like that. I’d quit comics for some time, burned out. But a funny thing happened when Sam went from baby to toddler to little kid: I picked up the 1966 movie on DVD. Popped it in. Soon enough, it all started coming back. Not immediately, but assuredly. As I got caught back up into comics, I really started thinking about the show again in earnest. How could I get it on disc? I can’t get it on disc? It’s never been released on home video? I’d pick up episodes here and there on cable but it wasn’t enough. Eventually, I did what I abhor: I went the bootleg route. Batman would never approve, but now I could go back to Gotham — that Gotham — any time I wanted. And I did, over and over. 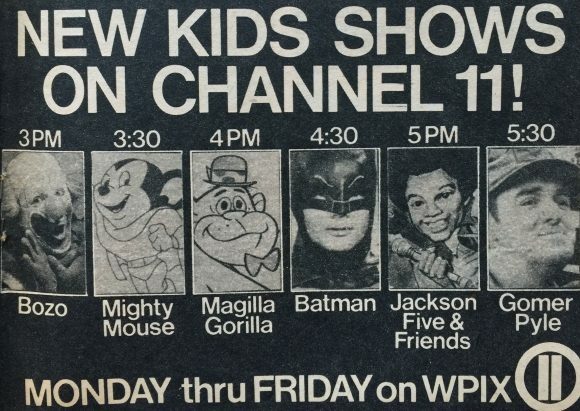 And like the steady surf at Gotham Point, it became ever clearer, ever stronger, just how much I loved this show, just how much it meant to me and my upbringing. How safe it made me feel. If Mom and Dad were yelling at each other, I’d go close my door and play Batman. Sometimes acting out the parts in my cloth Ben Cooper costume, sometimes with my burgeoning Mego collection. This was down to the show; I’d barely discovered comics. As an adult myself, I wanted to share it with my son. Convey to him how this show — and its hero — made me feel. Batman helped instill in me my moral compass and make me feel brave in a contentious, uncertain world. I called Julie Newmar right after I heard the news that Adam West had died. It was an interview, yes, but it was also just a conversation between two friends who lost someone they knew. Julie actually knew him, of course. Though I’d spoken to him a couple times, I really didn’t. I just knew the idealized version in blue cape and cowl, the father I always wanted, there in the immediacy of my TV screen. 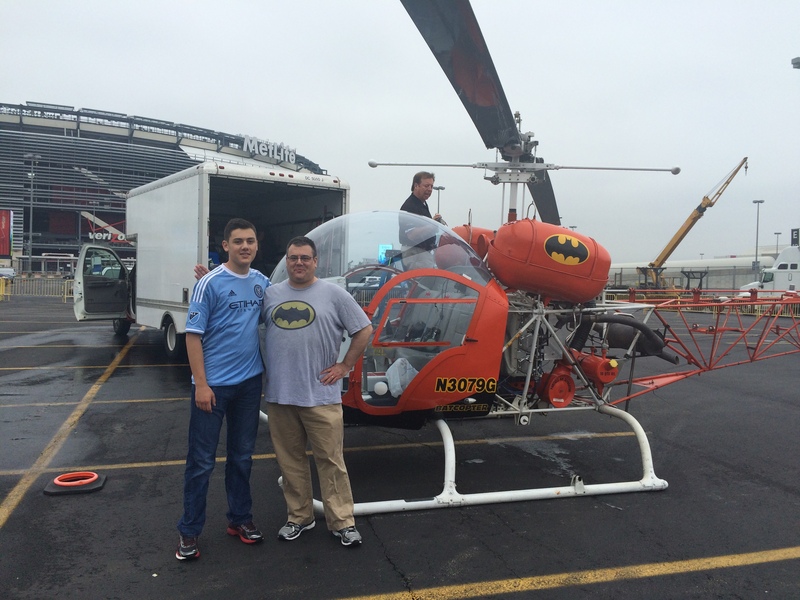 Sam and me just before we flew in the Batcopter a couple years ago. That’s Capt. Eugene Nock in the background. My son Sam’s now 18, a man himself but not quite. Still, he’s more Nightwing than Robin to my Batman. 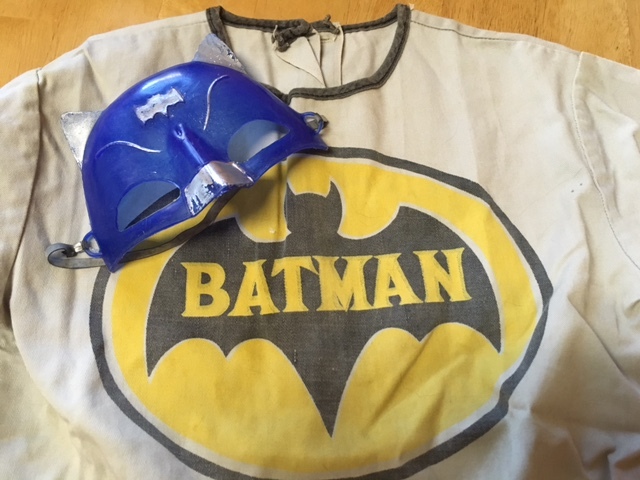 What Adam West gave to me, I hope I’ve given to him. It’s comforting that even though the world’s scarier now than ever, I can still put Batman on, now in all its high-res, remastered glory. It’s still a haven. 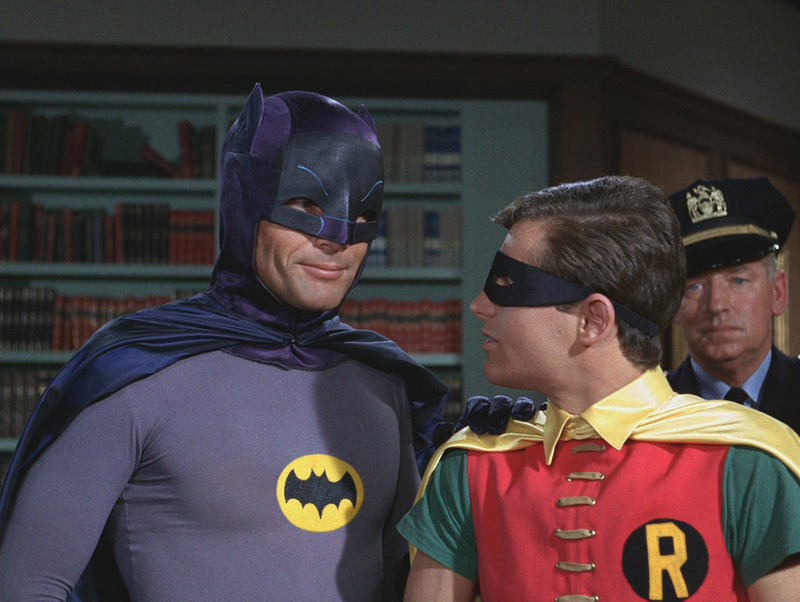 MORE — For ADAM WEST: A Birthday Celebration, a series of interviews and tributes to the greatest Caped Crusader, click here. A very nice tribute. 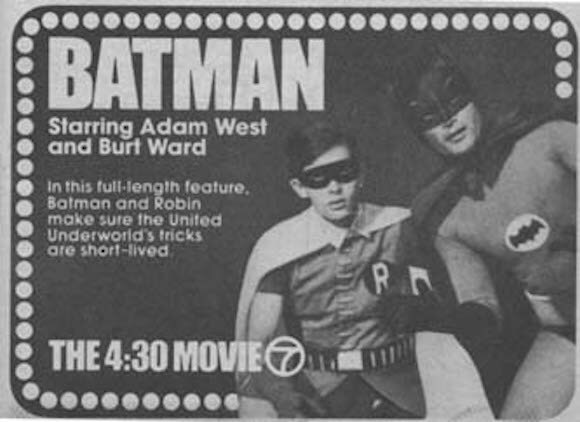 I too can relate to this bond with adam west’s batman. I am 52 and grew up on the reruns of this show and lost in space. They are both responsible for my life long love of comic books and science fiction. I can also telate to the comfort of these shows because they are my go to shows when life gets too stressful to bear. I lost my dad at a young age, i was thirteen, but like you prior to my fathers death our house was dysfunctional and my fathers frustration grew to outbursts of anger which terrified me to my comics and batman. Had i not sen batman i would probably not have found comics and had i not found comics i probaly would not have started to draw and my drawing defined me in the 70’s and 80’s in school where i was class artist in every sxhool i was in. Before the days of computers and printers i was the guy people ran to to draw album covers or their favorite heroes. I will leave with this memory of my first eight christmas’s, even though i got one the last christmas every year I couldn’t wait for santa to leave my. Rand new corgi batmobile towing the bat boat. I just loved those and wish i had them now. R.I.P. Adam( the one true batman) west! Great post, Dan. I echo the sentiments expressed by you and the other commentators here. He was a great Dad to many of us who needed it, and unlike many celebrities actually lived up to that hero worship when you spent time with him.